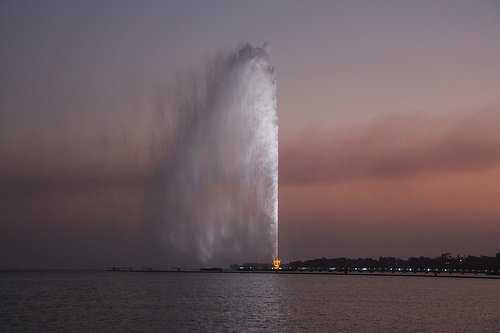 Jeddah’s famous King Fahd’s Fountain–the highest fountain in the world. Eighteen tons of water at any given moment, looking as though suspended in air, towering more than 800 feet above the Red Sea. 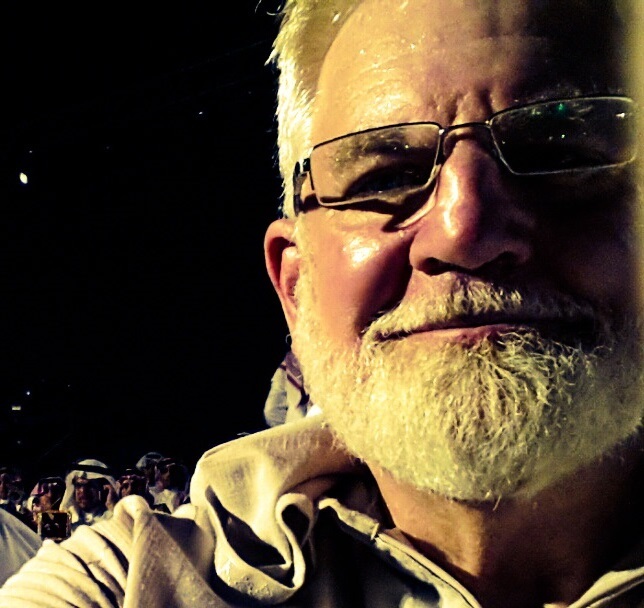 I’ve been living in Jeddah, Saudi Arabia, for six months now. I had seen the famous King Fahd’s Fountain from the rooftop of my building here, but never up close. So last night I flagged down a taxi and took off for the fountain! Water makes me think, and a lot of water makes me think a lot. Seeing King Faud’s Fountain last evening brought back a couple of memories. For one thing, it reminded me of the great Jet d’Eau fountain in Geneva, Switzerland. The Jet d’Eau (French for “water jet”) is one of Geneva’s most famous landmarks. I saw Geneva’s Jet d’Eau for the first time when I was beginning my world travels. I had just graduated high school from Bob Jones Academy and was working in France during the summer with the Evangelical Reformed Church. At the end of the summer I spent time in Switzerland and Germany before returning to the US to begin college. Seeing King Fahd’s Fountain also reminded me of some words from Jesus–something about a “fountain” in our hearts that would spring up in our lives giving life to people. This morning I pulled out my Bible—a book, by the way that Muslims throughout the world hold in great respect. (The Qur’an refers often to the writings of the Bible. The Bible, in the Quran, is called “the Book.” And Jews and Christians are referred to respectfully in the Qur’an as “the people of the Book.”) So, being a “person of the Book,” I was eager to find this passage. 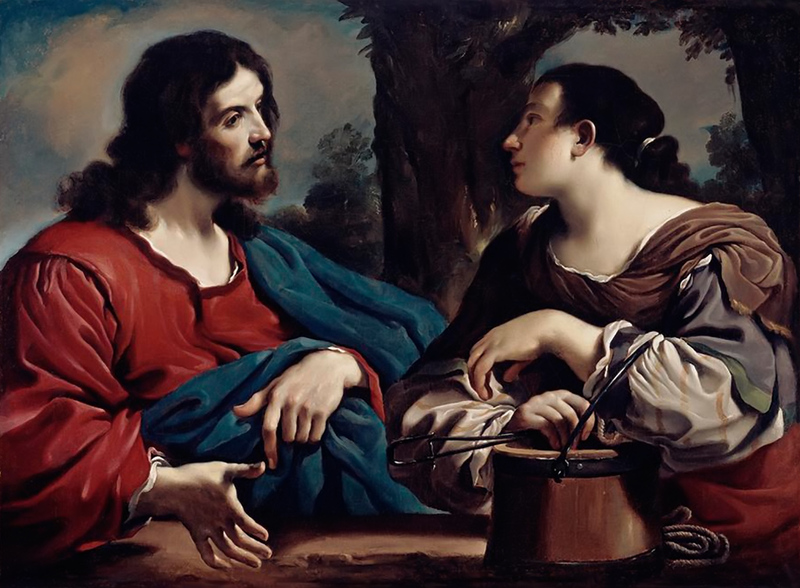 Christ and the woman of Samaria as depicted by Italian artist Giovanni Francesco Guercino. Jesus, when travelling north to the region of Lake Galilee (or Nazareth), didn’t avoid Samaria. We read in the Gospel of John, “Now it was necessary for him to go through Samaria.” In other words he had some work to do in Samaria—some compelling mission there. He simply had to go there. From this story we can see that Jesus was not a racist or xenophobic. The religious leaders of Jerusalem were teaching people to hate the Samaritans. We know Jesus had no hate towards anyone; however, he did have some pretty harsh words for religious leaders of his day. Jesus was full of God’s love and mercy! It had been a long trip—a lot of walking for many miles, probably at least 60 miles. Jesus and his disciples were tired and hungry. Arriving in Samaria, his disciples took off in search of food, while Jesus sat down and rested alone at a public well. And there at that well his mission was accomplished. Then we read that not only did Jesus continue the conversation with her, but he revealed many things to her about her life. He told her things that even some of her closest friends didn’t know. 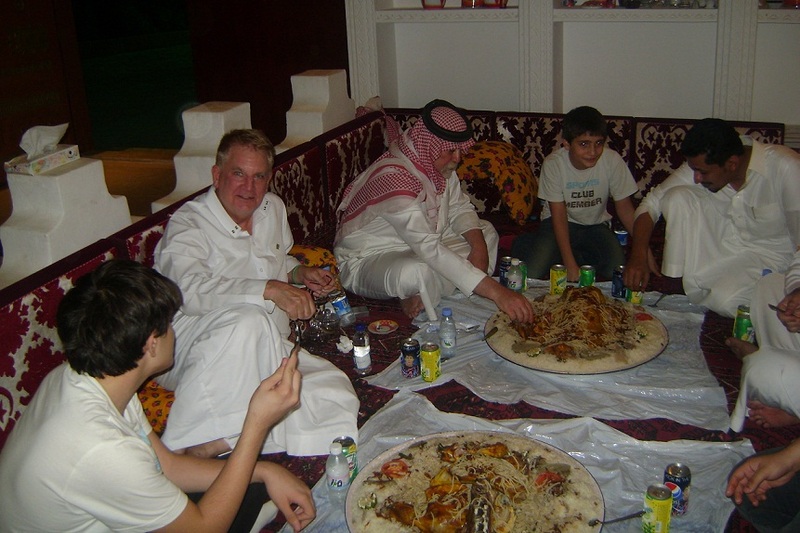 Sam with Saudi and Syrian friends having dinner Bedouin-style. Two huge platters of lamb and rice, complete with individual large bowls of fresh camel milk! Now this would have been extremely disconcerting to the Jewish religious leaders back in Jerusalem! They would have condemned Jesus for talking to her and then stoned the woman to death. Not only did Jesus go to Samaria, not only did he speak with a Samaritan woman at the well, not only was she a Samaritan woman—the Jewish religious leaders would have also considered her a horrible sinner—a prostitute, and, in their opinion, certainly no one should associate with such a disgusting, immoral person. Now the “fountain” part of the story! And then it’s said that the disciples returned, and were shocked to see him sitting with this strange Samaritan woman in public—talking so freely with her. Even today we disassociate ourselves from certain types of people who don’t behave as we behave. Many Christians and Jews today will not associate with Muslims. They are either afraid of Muslims, or they are offended by what they think Muslims believe about them. Sam with Muhammed and Waleed. We have no problem appreciating and caring about each other. There is so much misunderstanding in the world today, and if people would just communicate, as Jesus did with the Samaritan woman, a lot of the hate, bigotry and cruelty on all sides would dissipate. The disinformation about what the Bible says or the Qur’an says would be overcome if we would just sit down and talk. We ask, are there important differences between us Christians, Jews and Muslims? Yes. Do we agree on all aspects of theology? No—we never will. But we can also ask, do we Muslims and Christians have anything in common? Yes, both in our faiths and as members of the human race! Can we be friends? Yes! I now know that as fact. We all claim to worship the God of Abraham. We can kneel or bow in prayer and worship together. (I am doing that with my friends here!) We can show respect and love to each other. We can look at past injustices that were committed and injustices that persist today and seek to right wrongs and commit to doing right towards each other now and in the future. We can all be like Jesus who was tolerant and non-condemning of others who were different. All my friends here are Muslims. They are from Saudi Arabia, Egypt, Ethiopia, Lebanon, Syria, Palestine, Jordan, Yemen and Pakistan. We have already learned to pray together and to trust one another–but also important we love and respect one another as human beings. We work side by side, supporting and helping one another as we pursue forgiveness and reconciliation in the Middle East and around the world. Somehow, after reading this story about Jesus and the Samaritan woman, I just can’t picture Jesus rallying people to stone prostitutes, or to somehow make life more difficult for them than other types of sinners. I can’t picture Jesus organizing his disciples in North Carolina, to make certain lifestyles illegal or telling people to “break wrists” or “punch” people until they are just like you and me.